The trucks. Mercedes Actros Euro 6, 300bhp, cabs are 6 seats factory fitted all type approved with seat belts meaning the need to utilise and additional vehicle is no longer required. These trucks have the latest 360 Birdseye view Brigade recordable camera systems. Left/right turn blind spot cameras, reverse and forward facing cameras and of course all set up for a Birdseye view with the rigid being super imposed on the screen within the 4 cameras, this need watching on YouTube to be believed. Full tracking systems that track every movement of the vehicle including a reporting suite that reports driving events like fast cornering, harsh acceleration and deceleration. Lane keeping assist with Image-processing safety system from Mercedes-Benz. Warns the driver in good time by an audible signal if the vehicle leaves its lane increasing driving safety and relieves the strain on the driver especially on long journeys and when driving at night. Active Brake Assist is also fitted which offer a possible reduction of the risk of rear-end collisions and a reduction of the severity of accidents. This also minimises the risk of collisions with stationary obstacles within the system limits when driving at higher speeds. Attention Assist monitors the attention paid by the driver on the basis of various parameters, the display on the instrument cluster is modified for Attention Assist. The steering wheel is also extended by a steering wheel angle sensor. This Increases driving safety and helps to avoid accidents by warning the driver if fatigue or lack of attention are detected. 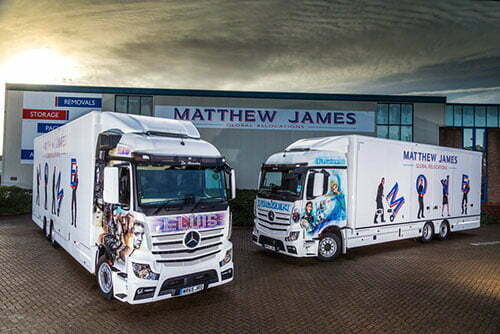 Both trucks are euro 6 in keeping with our commitment to reduce our carbon footprint and reduce emissions to a minimum. These were the first on the MJ fleet to see the new company livery. As with all our new vehicles there has to be something unique about them! The cabs are furnished in artwork, the first Frozen for the younger generation and Elvis for the more mature generation.